I loooove peanut butter. Have I mentioned this before? Yes, yes I most definitely have. I love nut butters in general, and as I have mentioned before, it’s a problem. I also happen to love ice cream. 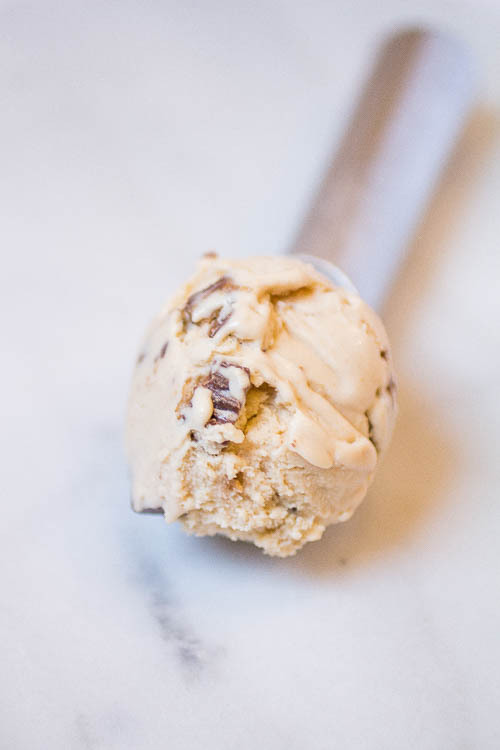 So, mix two of my favorite things together and you have one of the most dangerously delicious things to ever be produced on this earth: peanut butter cup ice cream. I also know I have said this before, but this is definitely the BEST ice cream I have ever made. Every time I think I’ve come up with the one. Nay. Nay I say. This is it. It’s the golden ticket of ice creams. The Stanley Cup. I made it last night and let it get hard overnight in the freezer so it would be perfectly scoop-able for my photo shoot today. It was the perfect thing to come home too after the day I had in class. The day itself wasn’t bad, but since I tend to get to class first, I somehow got sucked into cutting up tripe. Do you know what tripe is? I’d rather not say too much about it, because I don’t want to gross anyone out when you should be day dreaming about this ice cream, but needless to say I had to stop eventually because my face was pale white. ugh the smell. If it wasn’t for the smell….The fact that people actually eat that willingly is BEYOND disgusting if you ask me. anyway PEANUT BUTTER ICE CREAM. (and the funny thing is I made the ice cream technically after organ meat day, but it wasn’t as bad as I expected. I managed to handle almost all of my tongue. I had to pass it off to my partner though after a while) ok, AGAIN – forget everything I mentioned previously and focus on the most amazing ice cream you will ever make in your life. It’s so creamy and delicious. I’m almost sad that this ice cream is so good, because from now on, I will never be satisfied by any other store bought brand – sorry Ben and Jerry’s, but you have been replaced BIG TIME. 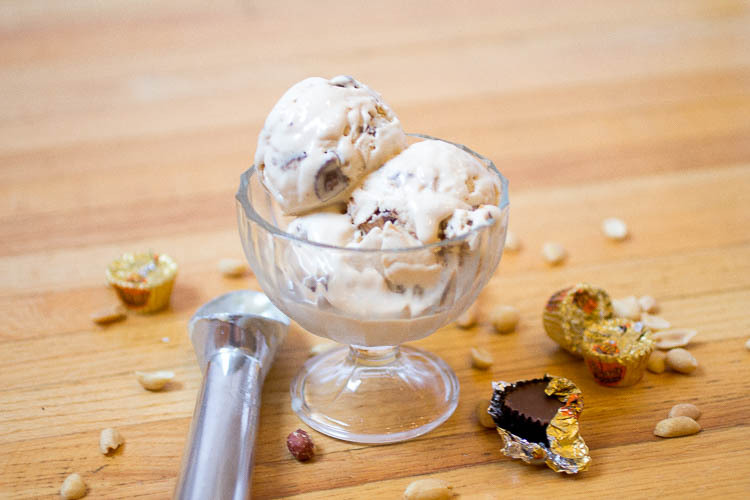 This outrageously creamy peanut butter cup ice cream will put every store bought version you have ever had to shame. Place the cream cheese in a bowl and set aside. Pour in the cornstarch slurry and mix well. Bring back to a boil and cook for 2 more minutes then remove from heat. Stir frequently. Freezing: freeze according to your ice cream makers instructions. 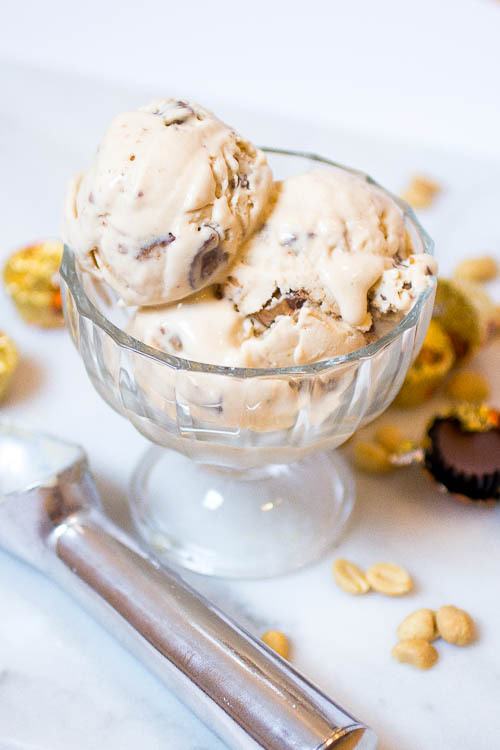 When scooping the ice cream out of the bowl, add several of the chopped pieces of Reece's between each layer so that there is at least one chunk in every bite!